Sculptor Anton Momberg says his subject’s "open hands are very important… They symbolise his honesty before his country, his realisation that everyone, all South Africans, must make a new beginning and repent. Anton Momberg set out to create an artwork that would remind us all what we heard when the Truth and Reconciliation Commission unfolded in 1996. "We all remember how he sat at his table and listened to the stories at the Truth and Reconciliation Commission. My concept is simple - to see him sit again and remember him that way - to remind us all of what we heard," Momberg says of his thinking behind the sculpture that commemorates day two of the very first TRC hearings at the East London City Hall in 1996. This was the day that TRC chairman Archbishop Desmond Tutu wept as he heard former Robben Islander Singqokwana Ernest Malgas describe his torture by security police. The powerful moment when Tutu wept with the anguish of a wounded nation brought the image and concept for this artwork to Momberg "overnight". Then, he says, "it was just a matter of doing it... There were no compositional problems or issues with expressing moods. The sculpture speaks for itself." The 1.5m-high work is a startlingly realistic rendition of Tutu sitting at his TRC table. Momberg's approach was to "make the artwork an intimate experience for the public, as opposed to creating a monumental sculpture that is usually something viewed at a distance". He adds: "I would like people to come real close to my depiction of Desmond Tutu - the artwork is slightly smaller than life size - and I hope that they might find it irresistible to stroke his hand." Through conceptualising and creating the artwork, Momberg says he has learned that "one can create great emotion without being melodramatic". The figure of Tutu was modelled in organic clay. A silicon mould was made of the clay figure. It was then cast in concrete. Oxide pigments were added for colour. Tutu's bench and table are made from bricks, plastered, pigmented and stained to the same colour as the figure. 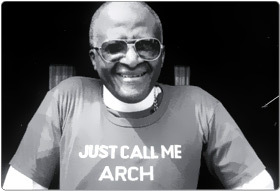 Tutu's spectacles are in steel. The bench at the table allows passers-by to sit down with Tutu and recall the emotion of that pivotal, very human moment in our history. Momberg believes his 15-year-old daughter, Hazel, sums up the impact of his artwork. According to Hazel: "Tutu's open hands are very important... They symbolise his honesty before his country, his realisation that everyone, all South Africans, must make a new beginning and repent - not just the bad people who committed the wrongs. "Not even Tutu knew how bad things really were during apartheid. At the TRC, he saw how bad it was - it made him cry, even - and he saw that everyone must start anew," Hazel says. "Now at last we can all say: 'Thank goodness it's over.' And we pray that there will never be anything like this again."